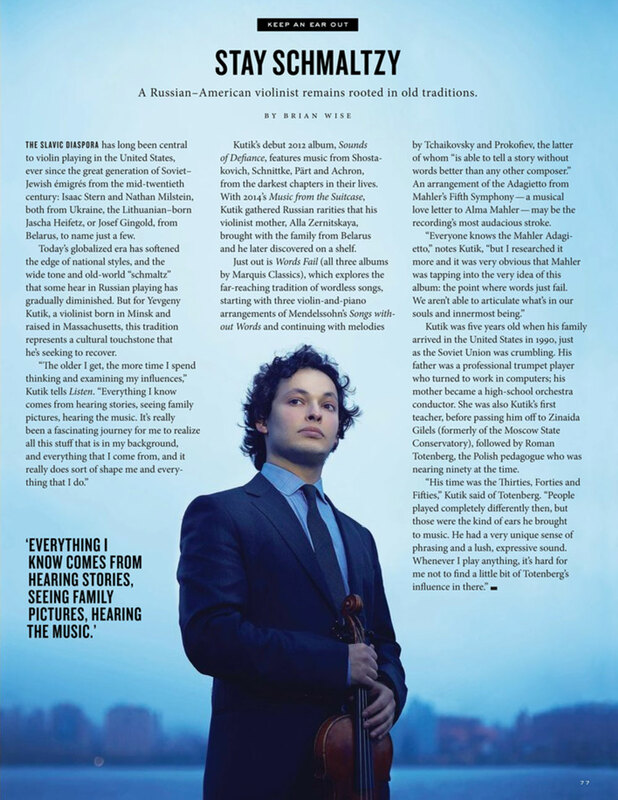 Yevgeny is featured in the winter issue of Steinway & Sons’ Listen Magazine. Read the article here. The Boston Globe selects Yevgeny’s album Words Fail for its Best Of 2016 List. “… a recital whose ambitious conception is matched by the precision and intensity of Kutik’s playing.” Read the full article. Yevgeny Kutik and Timo Andres in a captivating recital at National Sawdust: “Andres and Kutik have performed together only once before, but they make a wonderful pair…. These guys are good. Watch out.” Read the full review. Playing Where Words Fail: “… a truly memorable afternoon, with commitment, élan, and deep musical understanding.” Read the full review. “Violinist Yevgeny Kutik seeks to break that cycle. His new album Words Fail features a collection of wordless works, past and present, which speak to the indescribable power of music.” Read the full review. Yevgeny’s album Words Fail is Album of the Week on San Francisco’s Classical KDFC. View Album of the Week page. Yevgeny’s album Words Fail is Album of the Week on LA’s Classical KUSC. View Album of the Week page.